5am - A couple if days ago, my Indiana Jones hat went missing. Following my new thing when something goes missing, I bought a new hat! 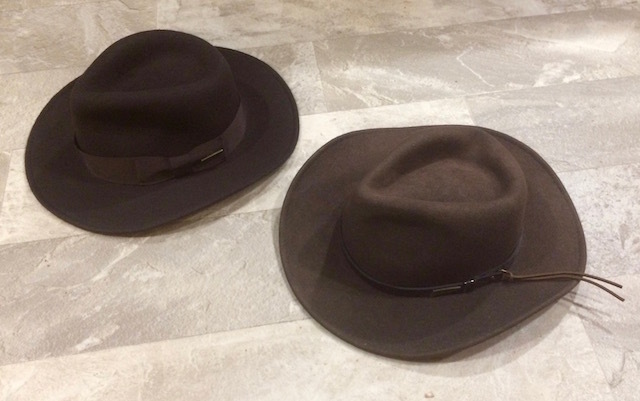 Now, I have two Indiana Jones hats. That's OK! Chances are, that now I will never be without an Indiana Jones hat! All of these happenings used to be "unexpected occurrences." But that was the past. Now, we have altered our perception of these things. Thus, with a masterstroke of re-definition, we have moved them all into the classification of "expected occurrences." Do typing errors vex you? Typing errors used to bug the hell out of me. But, no more! Typing errors have also been moved into the realm of "expected occurrences." There was a time back in 2003 and for several years after, when a Blogger did not have amenities such as "Older Posts" and "Newer Posts" links. In those Olden Days, I'd put my own HTML code links at the bottom of my Blog posts. These links were labeled, "Yesterday" and "Tomorrow". When Blogger came out with their own built in links for turning pages, my old links still remained. And they stand out like a sore thumb! Sometimes I have an occasion to go back and edit something in a long-ago Blog. And while I am there, I'll remove my old HTML code and correct my "Nite Camp Location Link." Plumbing items for Scampy's propane line change have not arrived yet. So, we are continuing with Twayler's extension drawer project. Converting from sheet metal screws in the wood box to 1/4" hex bolts. Morris Wenger was the Father of my girlfriend when I was age 17. Mr. Wenger was an amazing person. He brought his family away from the nazi scourge in 1938! A huge accomplishment when considering that most Jewish Fathers who lived in Europe and what would become nazi controlled areas, were unable to understand that dire threat. Mr. Wenger moved his family to the City of Monterrey in the State of Nuevo León, in Northeastern Mexico. Mr. Wenger wished to immigrate his family to the United States. But the USA was not inclined to allow Jewish persons entry during those critical years! Mr. Wenger supported his family in Mexico as a junk man. Going around the streets of Monterrey in a wagon collecting and buying anything that was available for trade. From this junk man beginning, Mr. Wenger evolved into a furniture dealer, with a retail store! When WW2 ended, Mr. Wenger did immigrate his family to Los Angeles. He established a furniture company there. That company, Wenger Furniture, has thrived and grown to multiple locations over the years. I spent a lot of my time over at Mr. Wenger's home in the City Terrace suburb of Los Angeles in order to be close his daughter, my girlfriend, Clara. It was during these times at the Wenger home, that I observed Mr. Wenger peeling apples. He was exceptionally good at apple peeling. The peels coming off very thin and mostly in an unbroken strip. I admired Mr. Wenger's skill with apples! Have not forgotten those apple peeling memories. I was invited for supper at the Wenger home many times. One time stands out. A guest who was at the table with the family had a number tattooed on his arm. Seeing that number, shocked and stunned me. I shall NEVER forget seeing that number! George, I always loved your Yesterday and Tomorrow links! Especially when one would click on Tomorrow and you had a kind note saying that Tomorrow hadn't arrived yet! One of many small kindnesses you showed your readers over the years...so thanks, George! And I am going to have to adopt (immediately) your re-categorization scheme for missing, dropping and breaking...or I will blow a fuse here in my old age. Tomorrow has not arrived yet! Before I moved "dropping things" into the expected category, I had taken to kicking the dropped item! I kicked a picture frame awhile back and broke the frame's glass! And thank you for URL to the German website. I'll definitely check it out. I learn a lot from you and your wonderful attitude!!! "I didn't vote, so you can't blame me!" advice from the late George Carlin. Expected occurances along with expected expletives. Thank you. "Pealing" has to do with sound. I had a hard time understanding how apples coule "peal". Then I realized that this was one of those occurrences!! Expected?! You got me on that one, Rose! My spelling "could" with an "e" is another one!! a word, it's not a problem. Enjoyed your story about peeling the apple; that is hard to do without the peel breaking before you finish. Our little Granddaughter, Clara, shares your long ago girl friend's name. Thank you so much for taking time to let me know that you enjoyed my apple peeling story. I have not thought about Mr. Morris Wenger for many years. And had a great time remembering and writing that story. Clara is a fine old fashion name. Not too many ladies with Clara for their name. Then in 2014 came the accident that destroyed MsTioga. I felt kind of low again. And that lasted for a long time too. After I made the decision to go live at the Jojoba Hills RV Park, my energy for Blogging returned big time! That's where I am now. Its been quite an experience for me! I have seen a few of those tattooed numbers, too, George...they are very hard to forget. That must have been when you were a Paramedic? As a paramedic and one time on a bus in LA many years ago. Only two or three times. Very sobering.